The main page is split into four areas. 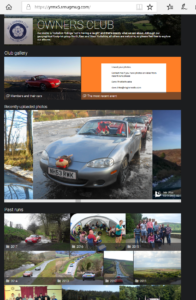 The club gallery showing members and their cars and images from most recent run. The past runs section with folders for each year containing galleries for each run. Also, rather than sending the administrators your pictures you can upload them directly to the site yourself. On a phone or tablet a similar screen will appear but without the drag and drop option and depending on your device’s operating system you may be able to select multiple files or just one at a time. 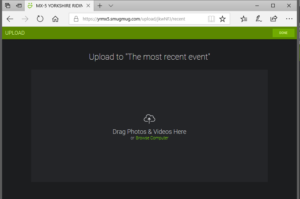 After you have uploaded your files check they are there by returning to the home page and looking in the ‘most recent run’ gallery. If you want these moving to a specific run folder please contact Dave Thistlethwaite via FB or email. He can also give you a temporary link to any folder for direct upload (such as for older runs).